• 100 BULLETS TPB VOL. 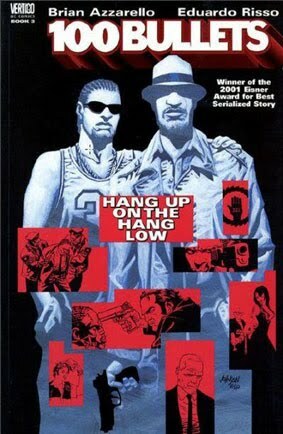 3 "Hang Up on the Hang Low"
• PLOT SUMMARY: The shadowy and dangerous world of 100 Bullets pulls another life into its web of intrigue in this third trade paperback collection of this modern noir classic. This TP brings us back to the gritty streets of the inner city, where the mysterious Agent Graves hands a young man called Loop one of his 'special' briefcases, and things only get worse from there.